Generally We make Poriyal and Masiyal with Palak. 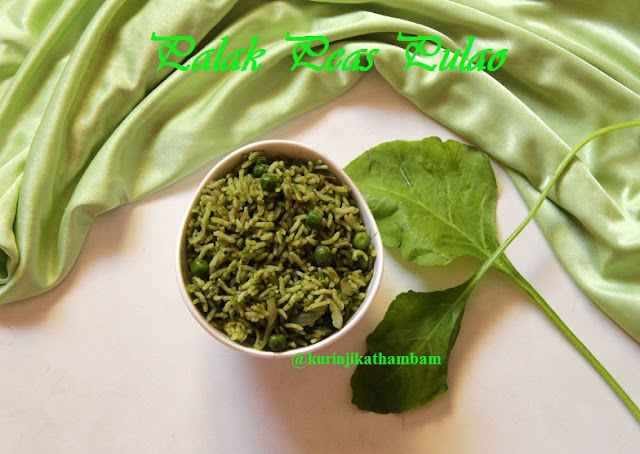 Palak Peas Pulao can be different way of using Palak. The Peas goes well with Palak; This is a good dish for packing as lunch in a Lunchbox. 1. Wash the rice, cook and then allow it to cool down completely. 2. Wash the palak leaves and remove the thick stems from it. Then chop the leaves into small pieces. 3. 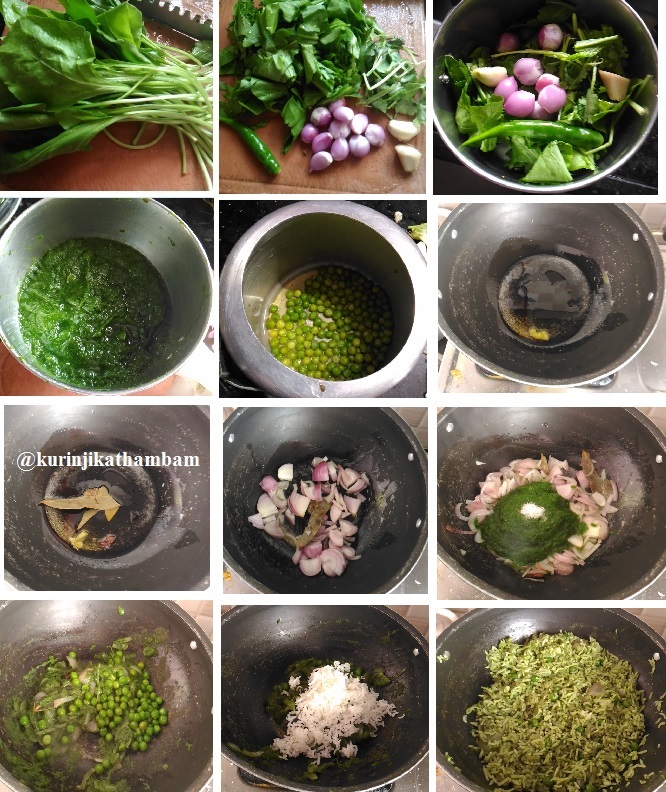 Wash and chop the coriander leaves into small pieces. 4. Remove the skin of the small onion and keep it aside. 5. Remove the skin of the big onion and chop it into thin slices. 6. Grind the palak leaves (from 2), coriander leaves (from 3), onion (from 4) , ginger, garlic and green chilli into a fine paste with very little water using the mixie. 7. Pressure cook the peas with ¼ cup of water in a high flame for 1 whistle. Allow it to cool down; after pressure has gone, strain the water from the peas. Keep it aside. 8. Heat the oil and ghee in a pan, add cinnamon, cloves, cardamom and bay leaf. 9. Then add the chopped onion (from 5), sauté till the onion become translucent. 10. Now add the ground palak paste (from 6) and salt, fry till the raw smell goes off and also the paste becomes thick. 11. Then add the cooked peas (from 7) and mix them well. 12. Add the cooked rice and mix them gently and cook for 3-4 mins. At this time close the lid of the pan and cook. Greenish and healthy palak peas pulao is ready. This goes well with raitha. 1. I have used normal rice, but you can use Basmathi rice too. 2. Adjust the green chillies according to your taste. 3. For grinding, you can also use ½ big onion instead of small onion. 4. You can oil instead of ghee or ghee instead of oil too. 5. You can use 2 tsp of ginger garlic paste instead of ginger and garlic. Click here for more Rice Recipes.